SKU: WK01. Category: Wiring Kits and Harnesses. This kit will save you a LOT of time if you are wanting to wire up a control panel from scratch to a keyboard encoder or similar. When you consider the cost of a packet of crimp connectors and around 20 metres of different coloured wiring it is also a very cost effective alternative. 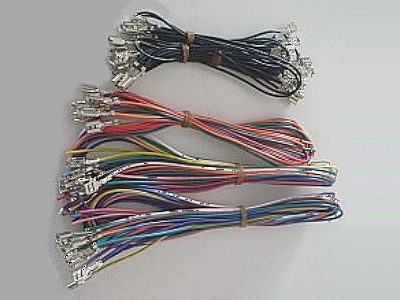 Each kit comes with 32 x 75cm long, medium gauge wires fitted with female quick disconnect plugs (or crimp connectors) at one end, along with 2 sets of “daisy-chained” ground wires – 1 with 26 connectors and the other with 8 connectors. There is an assortment of colours to make it easier to identify what they are connected to. Simply slide the connector of the wires onto the microswitch terminals, then gather the wires together into a loom and cut them to length. They are now ready to be connected into an I-PAC, or whatever other interface you intend them for. Add a few cable ties once it’s all done and you’ll have a very neat colour coded wiring loom. The Ground Wires are in two sets and there are many different ways for them to be connected, so you can tailor them to suit your own setup. These wires are all black in colour for easy identification. Note that there are enough wires in one Kit to fill all inputs of an I-PAC2. Using two kits will max out an I-PAC4 with a few wires left over.